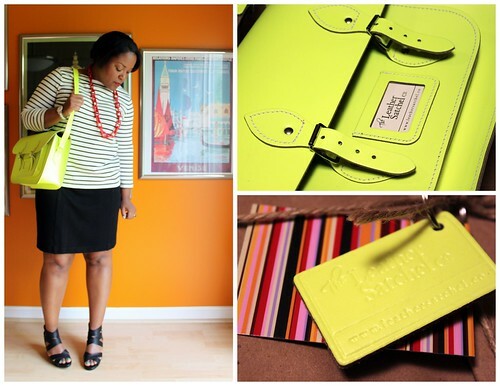 I’ve gotten lots of comments, emails and tweets about how to get your hands on my Leather Satchel Company neon bag. Well, they’ve finally opened their Amazon.com store for the US! When this package arrived on my doorstep I was tickled pink! The bag was just as beautiful as I had hoped it would be and the craftsman ship is just stunning. 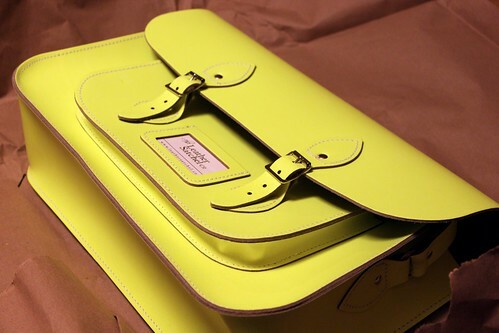 It’s such a beautiful bag and the neon yellow is so vivid and bright. It really does add a big POP to my wardrobe. I’m actually looking really forward to carrying this bag in the winter when everything is dreary and dark, my bag will be a bright spot on a cold winter day. As a blogger I’ve been very fortunate to work with lots of brands and I do receive a lot of items courtesy of that brand. The Leather Satchel Company has been one of the nicest brands I’ve worked with. They are absolutely great and I hope you’ll order a bag from them as well. There are an assortment of colors, I’d suggest the gorgeous deep purple or the highlighter pink, but you definitely won’t be disappointed. Has anyone thought about purchasing a classic satchel? Which color is your favorite? I am getting one for sure. I want a large one in bright pink. It will look quite smashing this fall against my black or camel wool coat and I can even rock it with my navy blue North Face down coat. 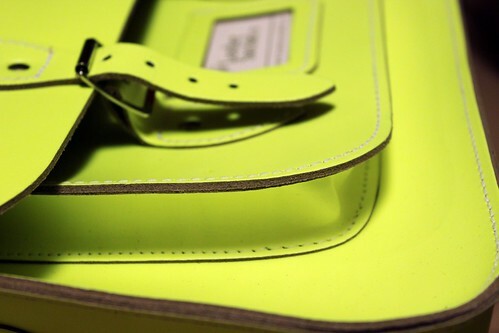 I like the classic shape and the funky color…really makes the classic bag more modern. I think I will have to add this to my wish list! I love my purple one, but wow these bags are everywhere now, almost as much as the Jeffery Campbell Litas! I got one of the last yellow ones the other day. A few minutes after I checked out, I went back to the page and they were sold out! Can’t wait to get mine. I’ve been wanting it since I saw your original post. You can also purchase these satchel company satchels at a great price from from http://www.carryall-uk.co.uk and they will deliver internationally.